The westernmost peak on the Crosscut ridge. Just across from Homer Hut climb tussock slopes to the left-hand gully, moving up right to the second gully and the snowfields above. The ridge itself is a pleasant scramble over loose blocks to the summit. Descending the lower bluffs can be difficult in snow or at night. This is the gully on the left of the Lindsay Stewart Buttress, 1500m to the summit. The first section to the shoulder of the Lindsay Stewart Buttress is around 65 to 80 degrees and conditions dictate whether it is climbable as this is where unconsolidated snow can lie, and without protection becomes a voyage of the damned. From the shoulder up to the Cul de sac is lower angled, around 50-60 degrees and requires a ‘grind it down’ attitude. These pitches could be simul-climbed by a confident party. In the cul de sac there are two to three more technical pitches before the final gully to the summit. 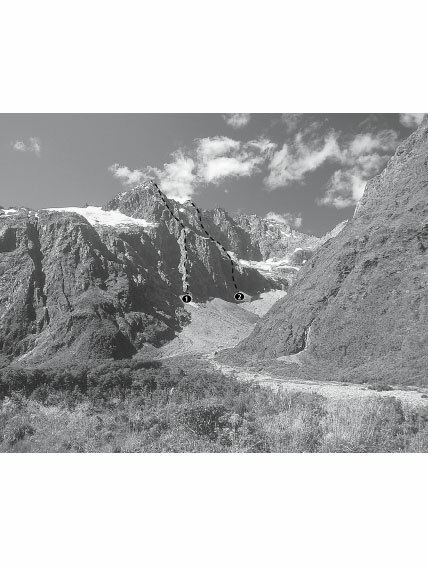 It is one of the great classic climbs in New Zealand and rivals a lot of similar routes in the Aoraki/Mt Cook area for comparable steepness and length. Most parties pitching all the route could expect to bivvy somewhere. Stories of climbers ending up near the top without bivvy gear and shivering away a winters’ night are common, and in the style of the first ascent. There are no easy descent routes that could be attempted in the dark. However if the Crosscut Bluff descent is in good condition, avalanche wise and there is a full moon it could almost be pleasant. The first section was climbed by Doug Warren and Ken Calder in 1973. Merv English solo to the shoulder, Bill McLeod soloed the full route in a day from Homer hut. Take the prominent rib from Cirque Creek to the West Peak, generally following the crest of the rib. The rock is shattered and dangerous in places. The south-west face. The upper right part of the face is made up of several clean grey pillars, with many cracks. The climb goes up the highest part of the face, immediately left of the second pillar from the right. A sustained climb with excellent sharp rock, mostly good protection and a poor finish. Pitch lengths are approximate. Map ref: NZTopo50 CB09 066 306 Access from the hut is either along the upper edge of the snowfield/glacier, or by skirting the lower edge of the snowfield and then scrambling up the thick seam of white granite on its right edge. Belay where the face steepens, just above the white seam and beside a small buttress with a mosaic of cracks on its left side. Onto the mosaic, step right onto buttress, slabby moves then slightly right into a groove and up to spike belay. Easily up to the base of the pillars. Belay directly below a major V-corner with buttercups and a white-vein crack on the right wall. Weave diagonally left at about 45 degrees across the broken face, heading towards the hanging, cracked slab on the distant skyline (a major landmark in the top middle of the face). A small pillar is the crux. Belay ledge is left of shallow left-facing corner. Corner, which switches to right-facing with an off-width section (poor chockstone runner), then easier to long rubble ledge which runs across right to main buttress below a fresh fractured wall (a bypass pitch may go more easily up groove to left of corner). Tricky moves in shallow finger-corners to low-angle slab below a deep corner with razor blade flake on its right wall and a tottering spike up higher. Avoid corner by climbing down left, across and up onto buttress. A long, left-slanting groove line, past a layback block, short chimney and devious move left across slab. Shallow corner with very sharp fist section, then easier to slopey section leading right. Several possible lines lie above, but if it’s getting dark, escape right. Traverse right across slabs to above ridgeline, climb down onto ridge, down loose rock slope and traverse right into rubble gully. Scramble up gully and buttress on right until confronted by a small spire and steep crack (might do better by scrambling further left). Spire and crack then chasm on right, around left and up to flat step in ridge. Scramble direct to summit. Hi Ian – I've tidied up the formatting of your route a little (if it's not quite right, it may be the limitations of matching reality to a computer system, or I may just have got it wrong – feel free to change stuff round) and deleted the duplicate. I assume there is a story behind the name that we will find out about one day! Help! Someone please delete the first version of The Wrongest Day (the one without South West Face in it). The one-way ratchet program doesn't seem to allow this. My excuse is I'm a new user. Thanks.